Snowstorms, tornadoes, flooding and droughts in 2011 have affected millions and cost billions. Here’s the National Climatic Data Center’s list of everything that’s caused massive damage this year. So far, 2011 has brought many major and tragic weather disasters throughout the United States. We have seen snowstorms, destructive tornadoes, major flooding and extensive droughts in 2011 that together have affected millions of people and cost billions of dollars. These are, according to data from the National Climatic Data Center (NCDC), all the U.S. disasters that have caused more than a billion dollars in damage this year. Let’s hope we don’t add more to this list. This huge blizzard caused insured losses greater than $1.1 billion and total losses greater than $2 billion. The Groundhog Day Blizzard brought one to two feet of snow across the Chicago area and created snowy conditions across Oklahoma City, St. Louis, Chicago, and New York City. This winter event killed 36 people. Strong cold air pushing south from Canada caught up with warm, humid air across the southeastern U.S. to produce severe weather and tornadoes in Arkansas, Iowa, Missouri, Illinois, Wisconsin, Kentucky, Georgia, Tennessee, North Carolina, and South Carolina. The system organized into a line of severe thunderstorms that brought extremely strong winds across the Southeast. It brought trees down all across the state of Georgia and the Southeast. Forty-six tornadoes were confirmed during this event, and nine lives were lost. Insured losses were estimated around $1.6 billion, with total losses of $2.3 billion. Another spring storm pushed through the U.S. Midwest and brought over $1.5 billion in insured losses, with total losses over $2.2 billion. During this event, a large wedge tornado struck portions of Mapleton, Iowa and destroyed over 20 percent of the town. A total of 59 tornadoes were counted during this time. Fortunately, no deaths were recorded during this event. The biggest tornado outbreak of 2011 began on April 14 as an estimated 160 tornadoes struck portions of the midwestern and southeastern United States, killing 38 people. Tornadoes hit portions of Mississippi and Arkansas and continued to spread east. The system is particularly remembered for the tornado outbreak across North Carolina. Insured losses of $1.4 billion were recorded, with total losses over $2 billion. 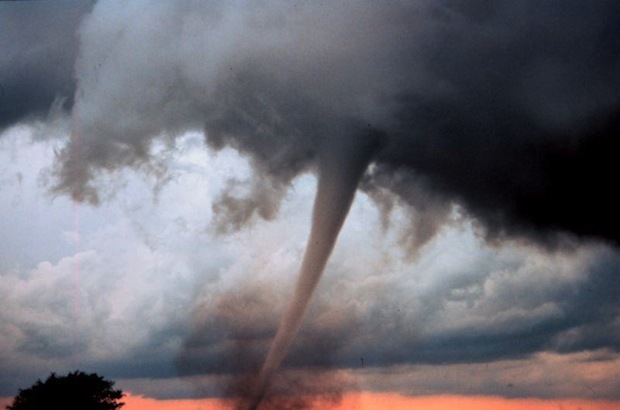 The biggest tornado event in decades occurred throughout these five days. The perfect combination of a strong jet stream, strong warm air advection, and a strong late April cold front created a significant tornado outbreak with over 305 confirmed tornadoes and 327 deaths. Losses were over $6.6 billion insured, over $9 billion total. Over 180 tornadoes were produced during this event, with an EF-5 tornadodevastatingJoplin, Missouri. The Joplin tornadokilled approximately 141 people, which made it the deadliest single tornado since modern tornado record-keeping began back in 1950. Sadly, 177 people died throughout thistime period. This severe weather brought$4.9 billionin insured losses withtotal losses greater than $7 billion. Severe and exceptional drought conditions have caused over $5 billion dollars in direct losses to agriculture, cattle, and structures. Unfortunately, the economic losses in the upcoming months will likely make this number grow larger. Wildfires across these regions were estimated to cost nearly $1 million per day. Temperatures rose over 100 degrees for weeks across many areas, and near 110 degrees in many places across Texas. A severe winter brought on a large melting snowpack that greatly contributed to the major flooding across these areas. Also, storm systems continuously moved across these areas producing heavy rain and flooding. With the combination of the two, historical flooding occurred along the Mississippi River. Roughly $2-$4 billion dollars in economic losses with two deaths were associated with the floods. More melting snowpack in the northern Rocky Mountains, along with heavy rains, caused significant flooding in portions of Montana, North Dakota, South Dakota, Nebraska, Iowa, Kansas, and Missouri. An estimated 11,000 people had to evacuate Minot, North Dakota due to rising waters in the Souris River. Over $2 billion dollars in losses have occurred due to the extreme flooding in these areas. These nine eventshave produced more than $35 billion in damages, and the numbers are expected to increase. Some estimates suggest that 2011 will be the costliest year recorded since 1980, which was the year NCDC started tracking billion-dollar disasters in the United States. As of now, we tie 2008 for the number of disasters in a year. However, we still have over four months left, and we could easily see another event affect the United States.